Is the resin here the same as frankincense tears? I notice this is a different method from the recipe you give for infusing frankincense into olive oil on apothecary’s garden. Hi Grace. Here is a link to the extraction method using oil. It works for all the different types of Frankincense. Hey Dan! I did it! Followed the instructions and filtered the oil and made a salve. Then I went right on and did the same with the Spruce sap I ordered from you a while back. Wonderful! Congratulations Kelli! I’m very happy you got the hang of it!! And especially pleased the instructions on the post worked for you. As far as the non soluble and darker part of your oleo resin , ( I assume from the Spruce or Pine saps), that did not dissolve, I’m of the mind this is lignan that the tree produced as part of its method of creating a callous that heals over damaged areas of the bark. It can regrow a special “scab” that grows in from the edges over time and seals the wound permanently. Often when wounded, the conifers will create special resin ducts specifically for this purpose. Also keep in mind that I do very little filtering of the sap before I package it so there may also be non soluble organic matter that is left over from the oleus solution. Best regards and good luck with your products Kelli! Good info again.Any suggestions to make an alcohol extraction.Which percentage should i choose?? If you are making an alcohol extraction, and want to separate only the resin and essential oils of the Frankincense, you will need to use alcohol of the highest proof and purity, so at least 96%. That way you won’t extract any of the water-soluble gum. If you let the alcohol evaporate gently at around room temperature, (covered with a thin cloth ro keep out dust), you will be left with a close to pure extract of the oleoresin which will dissolve easily in warm oils. Grinding the Frankincense prior to making the alcoholic solution will speed up the process. The finer you grind it, the more quickly you will extract all the oleoresin. There will be a certain amount of stirring and shaking needed in either case till the oleoresin are completely dissolved. If you would like to make a holistic or whole tincture of Frankincense then you would use an alcohol with about a 30% content of water and 70% alcohol. Again grinding it fine will help greatly. I hope that was of help. Hi! I love your site and thank you for all this amazing info! I was enjoying using this recipe with myrrh, and it probably shouldn’t have been too difficult, but,,@#$%, I managed to knock over the myrrh into the boiling water… So I’m wondering if there is a way to salvage my watery myrrh mush? Maybe as a tincture? Any advice would be appreciated! Hi, thank you for all this wonderful info, love your site! (Sorry if this is a repeat post, it looks to me like it didn’t post so I’m trying again.) I just tried to make this using myrrh, and though it seems like it shouldn’t have been too complicated I managed to knock the jar of myrrh over, filling it with boiling water… So… Do you have any recommendations for salvaging my myrrh water mush into any usable form? Also, WordPress tells me that you’re in rehovot? If that’s ever true I’d love to hear about classes or workshops that you’re giving, as I am in Jerusalem. I apologize profusely for the delay responding to your comment! I had started responding and WordPress swallowed it two times so I decided to take a break and come back to it later, which is of course much later than expected!. I realize it is too late to do anything about your spilled Myrrh. I will say that Myrrh is a tricky oleoresin to work with at the best of times and resists many extraction methods that Frankincense readily complies with. As you likely discovered, the Myrrh water soluble gum will dissolve in boiling water, leaving you with mainly the resin portion which you can then freeze, grind fine, and dissolve in an oil in your water-bath. Perhaps the accident was useful?? To answer your other question, I am in Hamilton till mid-December when I have a return ticket booked. Not sure if I will stay in Rehovot , somewhere else, or leave as soon as I can for Ethiopia. I would love to do some workshops while I am there, so keep an eye on this blog, I will likely post them here and they may be with short notice. Ah! Thank you, that is an awfully creative solution, sadly too late though, as I dumped some alcohol over it- any chance that tincture will be useful for anything? 95%, maybe 1:4. I guess it depends how much water got in it. For perfumery, straight 95% alcohol as your solvent is best since it collects no scentless gum. For medicine having some water with your alcohol, and water soluble gum in your tincture is sometimes preferred. So either way sounds like you have a useful tincture at 95% and a 1:4 ratio. In my imagination I saw it heavily diluted with the bath water. Sounds like that was not the case and you managed to pull together a fine tincture despite your misadventures with Myrrh. Hi. Thanks for visiting and I’m happy you asked. Contrary to popular marketing hype by essential oil companies, there is little, if any, Boswellic acid content in the essential oils of the 3 Frankincense types that have it. The Boswellic acids make up the heavy and sticky resin portion of Frankincense, much like the acids that form the rosin in our spruce and Pine trees. 1-Grind and powder the whole fresh oleoresin, take by the half teaspoon 3-4 times a day. It can be mixed with water in the mouth before swallowing, or mixed in a glass with water first. Must be kept frozen between uses to avoid solidifying. 2- Make an oil extract with an edible vegetable oil as in the post you just read. Take by the teaspoon 3-4 times daily or mix with food as in a salad dressing. Apply directly to the skin for inflamed or painful joints, coughs and tightness of the chest and to the face as a rejuvenative. Easy to process into salves and cremes. 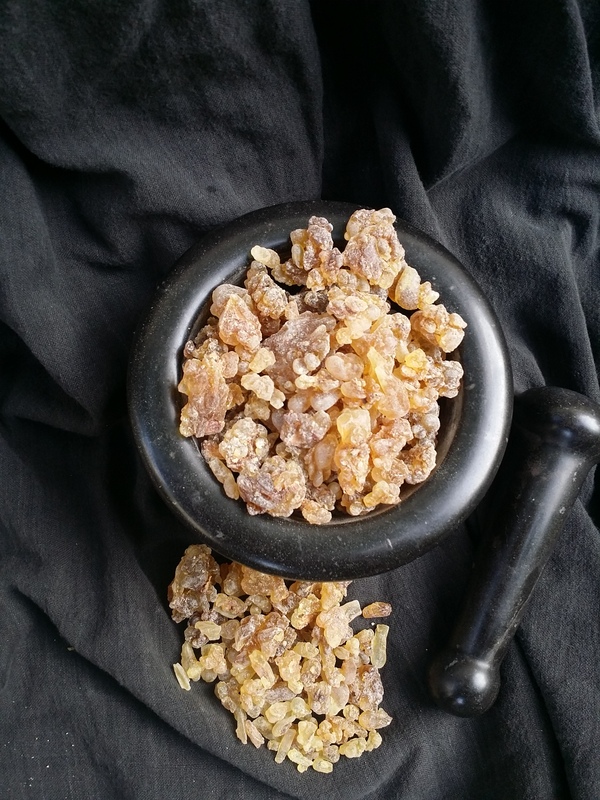 3-Make an extract of the whole oleoresin as in my post on “Fairtrade Frankincense”-https://fairtradefrankincense.com/2015/07/26/tapping-into-frankincense-and-its-boswellic-acids-an-easy-extraction-method/. You can then use this pure extract that contains both the resins and essential oils in oils, salves and cremes, or powder for internal use. By far the easiest and perhaps the best way to benefit from the Boswellic acids through internal use is the first and simplest method. Hi, thank you for writing such detailed posts and answering these questions. I am learning so much. But I have a couple of questions, one in particular to your response of Baki’s question. You gave 3 methods of using the resins. With the first method you suggest are you meaning fresh whole tears or the resin after getting rid of the water soluble gum? My other question is does the essential oil evaporate during the water bath or heating of the oil & resin? Would it benefit to add frankincense essential oil to the resin/oil mixture? Thank you. Thank you for your visit and questions. I just returned from my travels and apologize for the delay responding to your comment. Regarding your question whether the essential oils evaporate with the heat of the water bath, to the best of my knowledge, most of the essential oils start volatizing at close to 100 degrees centigrade. When distilling the essential oils from Frankincense, that is the temperature they mostly start coming over to the receiver. 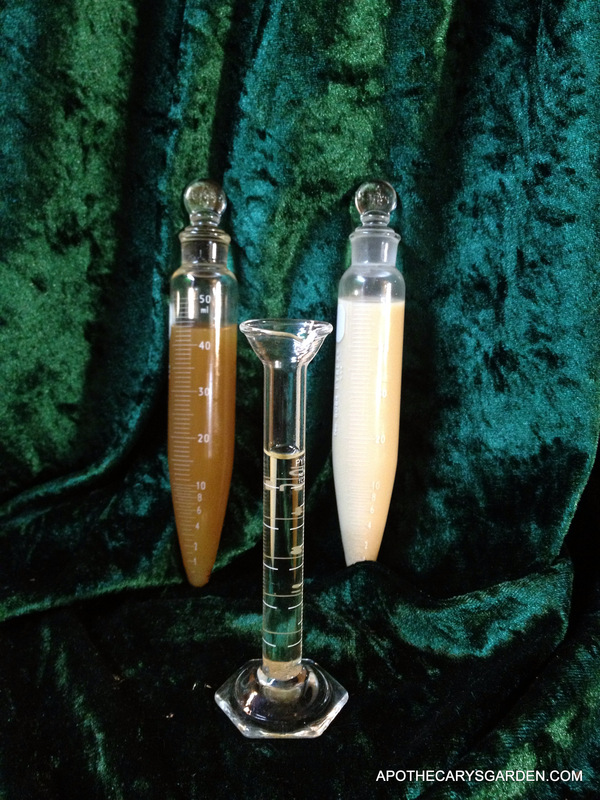 It takes many hours of distilling to transfer them all out of the oleoresin. That being said, if you can smell the Frankincense then you know volatile compounds are being released. My answer is,,,,,I honestly don’t know. My not knowing prompts me to err on the side of caution. For this reason I often add a touch of essential oil to an oil infusion of Frankincense. Regarding your first question, I may have addressed it in the comments yesterday, if not, let me know which post it was in and I can give you an answer. Yes, in that post the reference is to the resin extract and not the fresh tears or raw oleo resin. I will make sure to edit that post so it is easier to understand. 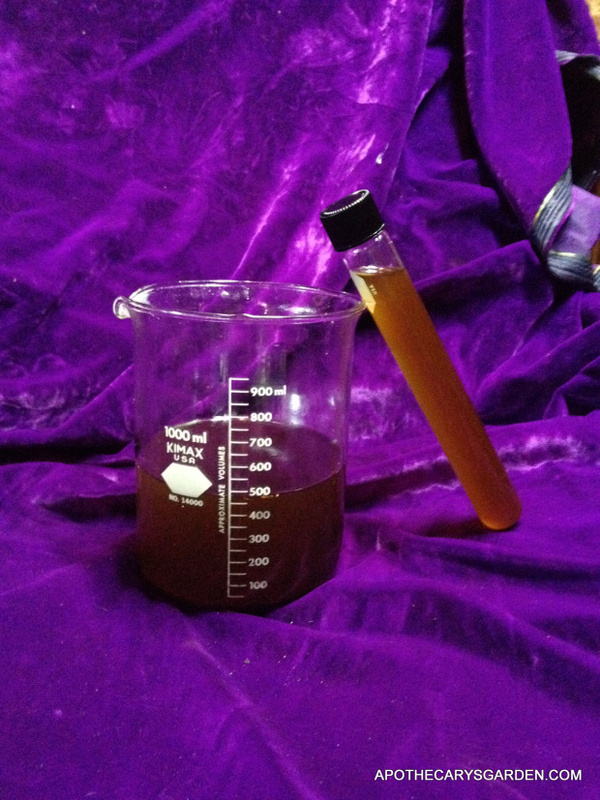 To make an extract/infusion of fresh Frankincense, you can use the method I outlined in this post-http://apothecarysgarden.com/2014/07/30/how-to-make-a-whole-extract-of-frankincense-and-other-oleoresins/. Thank you for visiting and bringing this issue to my attention. I was wondering if the Boswellic acid contents would be the same in the method of directly infusing the ground frankincense tears in oil and the one infusing the pre-extracted resin in oil. If so, what are the advantages of first isolating the resin (as per https://fairtradefrankincense.com/2015/07/26/tapping-into-frankincense-and-its-boswellic-acids-an-easy-extraction-method/) before infusing it in the oil? Will it just increase the solubility? Yes, you can utilize this resin extract in a solid perfume formula. I believe it has a broader scent profile than the essential oils of Frankincense and it should mix fairly easily with waxes and oils when preparing a solid perfume. Hi Dan, I love the detailed information you provide! My question is, if I want to take internally both Frankincense and Myrrh oil produced by the method you described, what should be the proportion of Myrrh to Frankincense to carrier oil? From what I know Myrrh may produce some side effects if overdosed. I can’t find this information anywhere. Maybe you can recommend some literature? Thank you! Thank you for your visit and question. I have yet to find literature that defines exactly how much Myrrh is too much. I can only share my personal experience and what I choose for myself which may or not work for you. Perhaps you will find it useful in making your own choices. There is a special relationship between Frankincense and Myrrh that goes beyond biblical references and Christmas mythology. I find, in my experience there is a synergy between these 2 oleo gum resins that reveals itself in many ways. When I combine or compound Frankincense and Myrrh, I do so in a proportion of 10 parts Frankincense to 1 part Myrrh. It is reminiscent of the well-known dynamic Chinese Yin and Yang symbol of the two opposites in a circle, each containing a small circle of the other in their center. In many ways Frankincense and Myrrh are polar opposites. One such example is that astrologically Frankincense is ruled by the Sun, and Myrrh by the Moon which is echoed in many of their uses. Myrrh is cold and astringent, and Frankincense is warm and expansive, or anti-inflammatory etc..
Myrrh has been reported to burden the kidneys when taken in excess. Exactly what constitutes excess is hard to determine, so even though the ratio and quantity of Myrrh you would be ingesting is likely quite small, keeping an eye on how your body feels or reacts to any new substance is important. Regarding the proportion of resin extract to carrier oil, I usually suggest a ratio of 1 part resin extract to 5 parts carrier oil. Best of luck preparing your extracts and please let me know if I can be of further help. When I dissolved the Gum in oil oil there are still some hard fine stone like particles left over. Could you please let me know what are these fine particles are. It sounds like you didn’t completely separate the water soluble gum from the oil soluble oleoresin. I would go back to the instructions on how to sepatate the gum in the post “Tapping into Frankincense and its Boswellic acids” and make sure you thoroughly wash the water soluble gum from the oleoresin before you try to combine your Frankincense with oils. I’m looking to make a skin oil/butter out of Namibian Myrrh and am curious if you could give me a pointer or two. In your opinion, should I A) just double boil the myrrh, oils and butters and mix them together (incrementally of course) or B) boil the myrrh to remove the gum then melt it with the other ingredients? Myrrh in general is trickier to work with than any Frankincense type. You might have to experiment. In general if you want to blend the oil soluble parts of the Myrrh, the resin and essential oils, you will have to separate the gum from them, thoroughly…. As far as ratios go, again, I think it depends on the product you are seeking to create. But, 1 part myrrh oleoresin to 5 parts oils and butters sounds about right off the top of my head. Oops! I’m afraid I didn’t find this page when making my frankincense extract in oil, and I heated the oil and resin together and used the microwave – 2 no-nos I have just read! The oleo-resin seemed to dissolve completely, though there is some settling if left to sit. Is it salvageable? Did the microwave destroy the healing properties or make it unsafe? I read the recipe from your site but didn’t see the warnings til now. Hi Ginger. If there is no burnt aroma, or darkening in your microwaved product, I suggest going ahead and trying it out in a product for external use. My posts are by no means the final word and there is much more for us all to explore here. 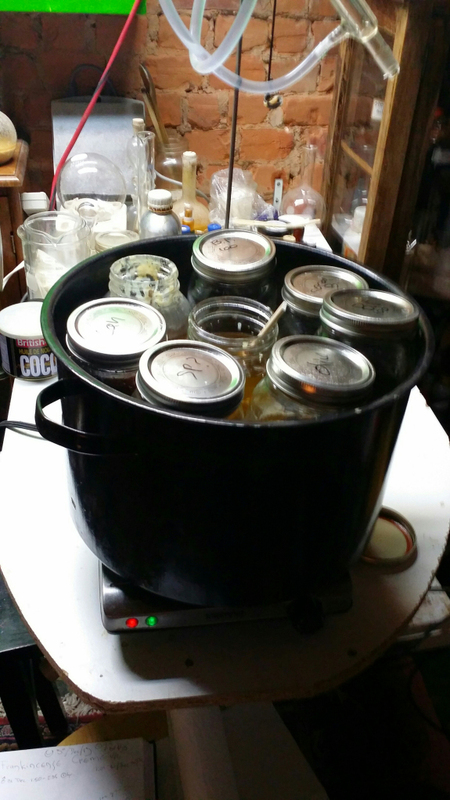 See how it performs, try the double boiler next time and compare. We are weaving ancient knowledge into modern culture. Experiment and explore. Find what works for you, and share it. You are on the right path. Keep going. Really Great work you are doing. Best Wishes. I have another question. Do you sell any of the three types of frankincense tears that have been confirmed to have boswellic acid in them? I didn’t see any of them on your etsy site. Thank you for this informative post, I will give it a try. Do you know if added to a face oil if it will clog pores? The resin on its own will not clog pores. So far, I have received nothing but positive feedback from readers and customers who have added a Frankincense oil infusion to their daily skin care routine.If you already have an oil or product you are happy with, the Frankincense infusion will not cause it to clog pores. Okay , thank you I will try. That’s a great idea and it is doable. The essential oils in oleoresins give them their softness and mobility. If you can evaporate the essential oil out of the oleoresin part, you will be able to heat it and mould it as you wish. When it cools to room temperature it will keep its shape. 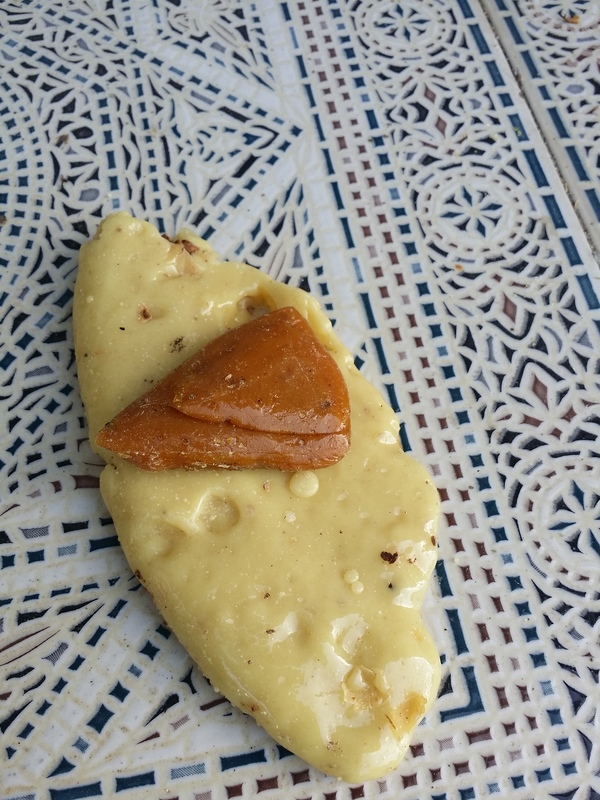 You first have to remove the water-soluble gum from it as described in this post-https://fairtradefrankincense.com/2015/07/26/tapping-into-frankincense-and-its-boswellic-acids-an-easy-extraction-method/. Once it is a pure oleoresin you can proceed to remove the essential oils and manipulate it to suit your needs. 1-put the resin in a container of your choice in the water bath and heat for an extended period, periodically removing some and testing to see if it is solid enough at room temperature. It may take hours. Another method is taking your pure oleoresin and put it in a pan or container in the oven. Start at about 250 degrees Fahrenheit. You will see the essential oils bubbling up through the liquid resin. Stir and test regularly till it is the right consistency at room temperature. Then heat it up some more so it won’t become soft or tacky on a hot summer’s day. You could also perform this evaporation of essential oil on the stove top, but it is a little harder to control the temperature and the rate of evaporation. This is a brilliant idea and something I have wanted to do for a while now. Best of luck with it and let me know if you have any questions along the way. In Arab countries Frankincense uses as chewing gum. with chewing what exactly happening? and if we want to dissolve chewed Frankincense or digest it what is the best solution we should use? thank you and looking to hear your answer. Some studies show that a process of oxidation occurs when natural resins are chewed. In the case of mastic resin, (Pistacia lentiscus), the phenolic compounds oxidize and produce beneficial molecules that are not present in the fresh oleoresin. Studies also show the act of chewing boosts a wide array of important compounds in the saliva. Many of which have therapeutic benefits. Regarding digestion, it depends which type of Frankincense is being chewed. In many Arab countries “Maydi” or Boswellia Frereana resin is imported from Somalia and used as chewing gum. 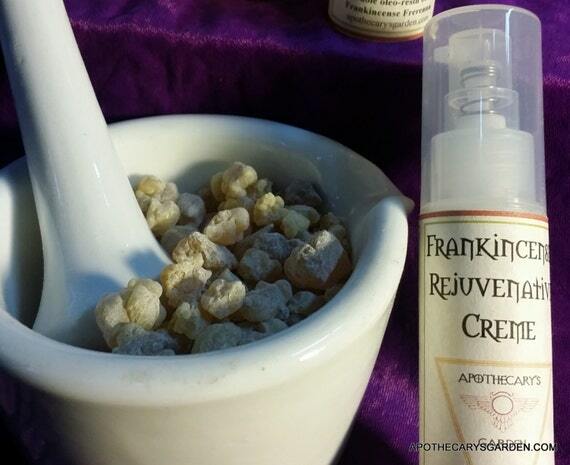 This type of Frankincense is close to a pure oleoresin with nearly no water-soluble gum. You can chew it for hours and it will not break down in your mouth. For this reason, it will likely be difficult for the digestive system to benefit from the compounds present in the oleoresin. However, one study shows that an extract of the Boswellic acids is absorbed to a much greater degree in the blood when it is consumed with oily food. Not on an empty stomach. Since the extract is a similar resin compound, my feeling is that the same dissolution and absorption likely takes place when consuming Boswellia Frereana oleoresin internally. This type of resin dissolves quickly into warm oils when making extracts and infusions, it seems the oily food may provide a solvent for the oleoresin and facilitate its breakdown in the GI tract. Though other types of Frankincense have a percentage of water-soluble gum that may help emulsify and break down the resin in the stomach, I prefer to take all types of Frankincense with oily food. From my own experience and customer feedback, the resin dissolved in carrier oils seems to be helpful with joint pain, muscle pain, inflammation, arthritis, mature skin and some types of skin blemishes. Seem similar. Can the first only been done with the three types of frankincense that have Boswellia acid? What can you do with the leftover frankincense from when you filter it besides throwing it away? These 3 types of Frankincense have been shown to contain Boswellic acids which display anti-cancer and anti-inflammatory properties in studies. Other types of Frankincense may well contain the Boswellic acids but have not yet been analysed for their presence. When dissolving the powdered whole resin in a warm carrier oil, the water soluble gum is left behind and filtered out. Since it does not dissolve in the oil, it remains as a rough grit and can be used as an exfoliant in soaps and oil based products. Can you comment or is there any benefit on non-heated extraction method ie powder infused in oil and keep in dark place for weeks before filtering and use? Thank you. Hi, I just discovered your site and am learning so much. Thank you. I am wondering if there is a reason the water sokuable gum needs to be removed. I ask because I make a face oil blend for self use and I add a ground frankincense bead to my 15 ml oil blend. It appears to dissolve and the minute amount of sediment that falls to the bottom does not bother me. People comment on my skin and want to try my blend. I thought I should ask before I share my blend with others since I found your site and you have such an immense knowledge about using frankincense. 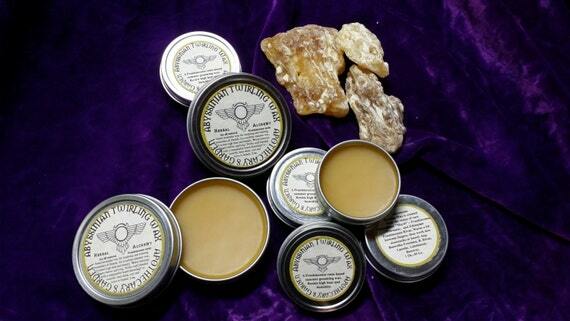 Usually, powdered Frankincense will leave a gritty residue of undissolved gum when it is blended with an oil base. I suppose if you blend only a small amount of Frankincense in your oil you might disregard it but if your preparation contains 1 part Frankincense and 3 parts oil, it often detracts from the texture of the formula. Some people let it sediment and pour off the clear liquid but I prefer filter it out. However, some people utilise the gum grit as an exfoliant and bottom line, if it does not bother you then there really is no problem.